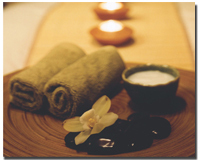 Some of the earliest spas in the world were set up in Asia Minor. The word spa comes from the Latin phrase, "salus per aquae," or "health through water." Modern spas are fashioned after the historical healing centers which offered hot springs, curative mud, sand scrubs and healing massages.